This New Year's eve we are having a "Blue Moon". 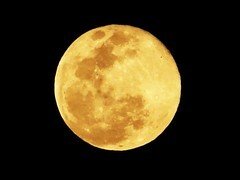 The Blue Moon is a second full moon within the same month. I don't know what it may mean, from an astrological perspective, to have the Blue Moon coincide with New Year's eve, but I hope it's auspicious for all of us. I was interviewed last week by a reporter for the Downtown Journal who was looking for reaction from local cyclists to the Marq2 Project. The reporter had come across my blog, read up on that subject here and must have figured that I was guy with opinions and so he tracked me down. I told the reporter that I had mixed feelings about the Marq2, because while the cyclists of Minneapolis lost two more bike lanes due to this project, I am also pro-transit, and I did think that this project was a positive move for transit. My main points on the Marq2 Project were that I felt the City failed to make accommodations for cyclists during construction, and cited examples of times when the bike lanes were closed with no suitable detours to make more room for cars on the construction-narrowed streets. My other main point was that despite the lip service Minneapolis gives to trying to increase mode share for bikes, the reality is that our downtown bike infrastructure is not that great. 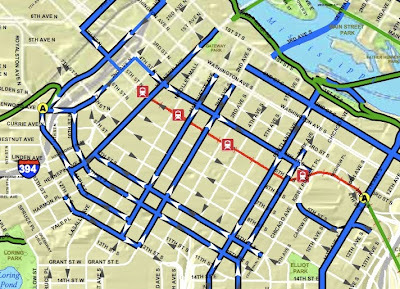 The image above is an excerpt from the City of Minneapolis bike map that is available on line. The snip is the section that covers the heart of downtown. As you can see, we have designated bike lanes ringing the Central Business District, but nothing in the CBD itself. The north-south routes on Marquette and 2nd Ave have now been removed, so that means our only designated lane north-south routes are Hennepin and Park/Portland Ave. That's 10 to 11 blocks of the downtown area without a designated bike lane going north/south. If you want to go east or west, your not much better off; we have east/west lanes south of the CBD on 9th/10th Ave. and we have an east bound lane on 4th (you are kind of SOL if you need to go west on the north end until you get as far north as River Road). Now, I don't need a designated bike lane to get around downtown. I fall into the "A" rider category; I pick my routes based on convenience and speed, and I am willing to ride in traffic to do that. I do appreciate bike lanes and generally feel a little safer in a bike lane in heavy traffic areas, but I will claim my lane when I need to. The thing is, most people are not in this category. If Minneapolis truly wanted to increase mode share for bikes and decrease downtown traffic congestion, then putting in more designated bike routes in the CBD to encourage the less confident riders to commute by bike would be a logical solution. The problem, I believe, is that doing so would mean taking away from the car lanes. 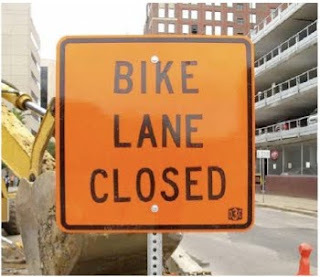 Until Minneapolis is willing to do that, and create more space in the Right-of-Way for bikes, the claims about being so bike-friendly will only ring true for the recreational riders who are happy to toodle around on the Parkways as far as I am concerned. The Storm of the Century!! Christmas brought us the much-hyped "The Storm of the Century" - supposedly the most snow we've had in years and years. What we actually got was about 9-inches of wet snow. Yes, it was inconvenient, but I would hardly say this was the worst that Mother Nature has to dish out for us this winter. We did change our plans somewhat to accommodate the weather, traveling to my Mother-in-law's house before Christmas rather than over Christmas. We faired well, however. Plenty of wood for the fire place, plenty of food for the Christmas feast and plenty of time to relax. I finishing a few books, helped to push a slacker neighbor out of the snow, rumbled around the snowy streets in my four-wheel drive truck for a few days and generally enjoyed some adversity to life in a major city. The downtime has me thinking about goal-setting for next year (I don't make resolutions; I do goal-setting instead). I did pretty well on my personal goals for 2009 in retrospect, and that feels like a victory to me. I am not quite ready to post the 2010 goals, but those will probably go up here in the near future. Christmas 2009 was almost the Christmas that wasn't. December is always hectic at work, with the usual year-end duties like the annual off-site planning meeting, performance reviews, compensation committee, etc., Plus we had a few proposals to get out, board and bank meetings to attend, and personnel matters to resolve. All this non-secular noise gets in the way of the Christmas spirit and saps my energy for much more than eating, sleeping and going to work. 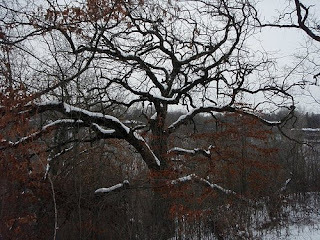 Nevertheless, I have taken a few days off, gone for some walks in the woods, and I am now finding time for some Christmas thoughts (by the way, I love that "never the less" has been collapsed into one word). I have seen a "friend" or two on Facebook join groups like "Keep Christ in Christmas" and read the predictable op-eds on the Holidays (my favorite was an absolute hissy-fit by Garrison Keillor in the Star Trib last Sunday), but despite this (or because of it), I find I am more tolerant of alternative takes on The Holiday this year. We have taken in a few Quaker meetings at the Minneapolis Society of Friends meeting house recently, and it's been interesting. Friends believe that God speaks to them directly and individually, and they are not into spoken prayer and responsorials, which I am more familiar with. However, Friends meetings are not all silence; several times per meeting someone will get up and share a thought or insight. Sometimes I find I agree with what was said, other times I admit to wondering what the heck they are tuned into. But regardless of my reaction, I have come to realize that they felt moved to make a statement, and it was/is important to them, and therefore it's worthy of considering. After all, their insight might end up being an epiphany for me, potentially. It would be shame to miss an epiphany because I dismissed the words or speaker due to impatience or bias. I have come to the conclusion that there are two kinds of Christmas presents - the common Christmas present is the material stuff that people give you at Christmas time; the second, more personal present is what you discover about yourself, based on the experiences of the past year. I'll see what my common Christmas presents are tomorrow night, but I have concluded that my second, personal Christmas gift this year is greater appreciation for the importance of tolerance. There has been plenty of things I didn't like about this year and plenty of things I didn't agree with, but I can see that we all need a little adversity to grow, much like a knife needs a hard sharpening stone to regain its edge, and we need to be tolerant of other opinions and difficult situations to benefit from these learning opportunities. On that note, I wish each and every one of you unconditional health, happiness, security and general well-being this Holiday season, whether you are celebrating Christmas, Hanukkah, Kwanzaa, the Solstice, or Festivus! This post marks yet another year I helped out with the Christmas Bird Count (CBC). I don't know how many of these I have done - maybe a dozen or so. When I started we had an area in Farmington near the refinery. 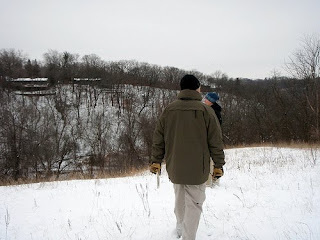 After that we had an area in Eagan that included Lebanon Hills park. For the last three years (since I have been back from CT and AK) our area has been in southern Bloomington, and includes Nine Mile Creek park. The Nine Mile Creek location has been surprisingly good. 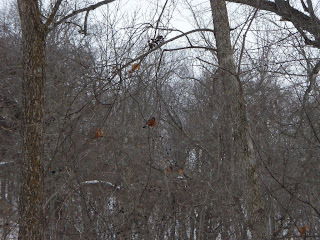 We have located Barred owls the previous two years (not this year, though) and we have a flock over-wintering Robins that only seems to get larger each year. This year we were treated to over 100 Robins. Nine Mile is also an awesome location for Red-bellied woodpeckers; this year we had 15 of them, which is a record for us at this location during the CBC. One blessing was that it was 20 degrees and still today. Two years ago it was about -10 degrees out and last year we had heavy, heavy snow. Both make for slow birding. The warm weather was appreciated by birds and birders alike, and while we didn't see any "good" birds, we did see a lot of birds. 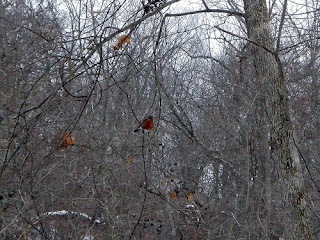 Mobs of chickadees, swarms of robins and plenty of Mallards, woodpeckers and Goldfinches greeted us. A little CBC history: prior to the turn of the century, there was a tradition in some locales of a "side hunt". People would divide up into teams, and venture afield with shotguns; the team that came back with the biggest pile of dead birds was the winner. Yea!! Ornithologist Frank Chapman, an early officer of the Audubon Society, proposed a new holiday tradition that would count birds without killing them. 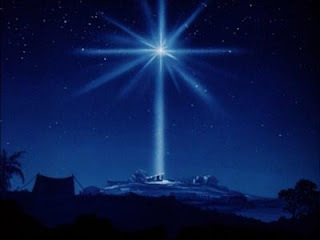 The first CBC was held on Christmas Day in 1900. They got 25 species, which is 6 better than we did today. I'll post the day's tally once I get it, but it amounted 19 species as I recall. Like I said, nothing to write home about, but a good day afield. We are on Day 2 of the new transit nervana promised by the completion of the Marq2 Project. 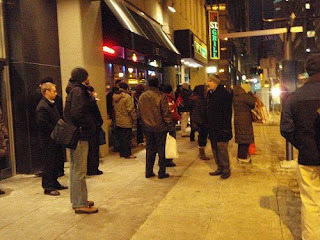 The Marq2 project was a down-to-the-dirt reconfiguration of Marquette and 2nd Ave. in downtown Minneapolis. Previously, we had two north-bound car lanes on Marquette and one south-bound bus lane plus a nicely sized south-bound (counterflow) bike lane. We had the same, in mirror image, on 2nd Ave. The Marq2 conversion gives us two north-bound car lanes, two southbound bus lanes and NO bike lane. I've bitched about that at length on this blog, ranted to Transit for Livable Communities (who seemed like they could care less) and otherwise shouted into the wind on this issue with no effect, so that's what we've got. The concept for Marq2 is to move the express buses (mostly to the 'burbs but there are a few MPLS limited service routes that also get to use Marq2) north on 2nd and south on Marquette and get them out of the downtown quickly. Good idea in principle. The Marq2 project included real-time bus schedule screens and heated shelters (neither of which are installed yet, but that's a minor detail) and stops labeled "A", "B", "C" and "D". Buses leapfrog around each other, picking up passengers at every other stop or so and passing waiting buses in the new second lane. It's been cold and life has been difficult these past few days, so I have retreated to transit for my commute lately. One route option for my commute is the 133, which gets to use the new Marq2 facilities, so I gave it a go last night and today. On the first ride from downtown, the bus was about 15 minutes late. Tonight we improved that by 5 minutes, so I boarded only 10 minutes late and got home about 15 minutes later than scheduled. I can see that the second lane makes a difference in moving through downtown, but I am still smarting from the loss of the bike lane. I think bikes could easily share the southbound lanes with buses on Marquette and the northbound lanes on 2nd and may claim it, but there are cops mid-block directing traffic that will ticket scofflaws, so I'll be doing this selectively. I will be curious to see if the buses are on schedule by the end of the week (good thing we had the street closed off for a month fur bus "training" prior to opening the streets to transit, no?) and when the bus schedule boards and heated shelters get installed. Hopefully that won't be a "next spring" project. 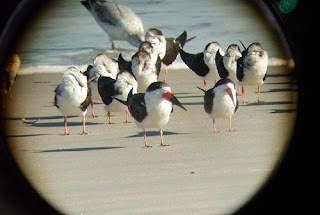 This Saturday will be yet another Christmas Bird Count. I don't know how many of these I have done - a dozen, maybe? These are always a bit of a crap shoot; we usually see quite a lot of birds, but few good ones (although supposedly any bird is a "good bird" on CBC day). That said, all birds are not equal. Like everyone else wandering around out there, we always get a lot of crows and chickadees, and in the warmer years we can pound out an impressive number of Canada geese as well. The best birds are the ones that seem to only come in single servings. We have seen Long-eared owls, snow buntings, Barred owls, Northern shrikes, and one year a Glaucus gull (although the GG was outside our CBC area) over the years, and those are the ones you remember for a long time afterward. The CBC is one of the relatively few times per year when I venture afield with others. I have been doing most of my birding solo after losing partners to moves, family responsibilities and in one case, an untimely death. I used to joke that I had planned to go birding with a friend last weekend but he got married and had a family so he couldn't make it (in every jest there is a grain of truth). At first solo birding seemed a bit odd; like going to the move theatre or eating in a restaurant alone. I've come around to it, though. I enjoy the operational flexibility of setting my own schedule, working as hard as I want to at it, and hitting the spots I want to explore. What I do miss, however, is sharing the experience with someone else. Unless you've been on the excursion, you can't really appreciate it fully, so that makes the war stories all that much more difficult to convey (and probably all that more tedious to my listeners as well). I've toyed with the idea of seeking out a new partner once or twice, but it's kind of an important relationship and I am not sure a premeditated match would work all that well. I've ventured afield with some out-of-towners, or people that are new to the area before, and it's almost always a challenge. If we kept at it, we might both find the groove and work it out, but personality seems to count more than persistence for this sort of thing. I don't see my CBC partner but once or twice a year, it's like old times when we get together because we've had the same area for years now and he's one of these friends that you can not see for a year and just pick where you left off. I am planning to participate in a few MOU trips this year, so perhaps I'll find a decent match through that little series of adventures. Until the right partner comes along, however, I will be very content to continue wandering off into the brush with my binoculars and me, myself and I. We snuck out of town on Friday for a quick get away to St. Peter, MN, booking a reservation at the Konsbruck Hotel, a new hotel in a historic building in downtown St. Peter. The Inn is located on the second floor, above Richard's Restaurant at 408 S. Third Street in downtown St. Peter. The Konsbruck Inn It's a great combination of modern amenities and historic charm; the rooms were beautifully decorated with antiques, and the bed was large and exceptionally comfortable, and the room featured a new flat screen TV, a small fridge outfitted with complimentary snacks and soft drinks, and bathroom that had both a large shower and a beautiful, huge tub. The staff was very helpful and courteous, and delivered a complimentary rose to our room and promptly delivered a new light bulb for one of the lamps in our room after we noticed it was missing a bulb. In short, it was one of the best rooms we have stayed in a long time. I sampled the dinner menu at Richard's that evening while the spouse and her sisters went to the concert at Gustavus. The hanger steak and small green salad were delicious and the service was excellent. While I was eating, a good acoustic band set up in a corner of the restaurant and began playing, making what seemed like a perfect evening just a little better. One small cloud appeared on the horizon, however. I noticed a "No Parking after 2:00 AM" sign on the street when I pulled in to the hotel and looked for off-street parking associated with the hotel. The only parking behind the building that I saw had a large sign indicating it was reserved for a bar or social club next door (the Redman Club - how politically correct is that? ), so after dinner I asked the front desk staff about parking. I was told by a staff person that I could park in front of the building and that they would let the City know that we were guests and identify our vehicles to allow for parking overnight. It turns out that's not entirely correct (duh), and I awoke to find parking tickets on my truck and my wife's car. I admit to being more than a little irate about the whole thing, but to their credit, the Konsbruck Hotel promptly followed up on my complaint and set this misunderstanding right. What's more, the personal follow up on the problem really impressed me a lot - it's clear the management is really focused on the customer and that they are trying to really set themselves apart from the chains, which I applaud. Two thumbs up for a great independent hotel with excellent customer service. It's nice to see The City show a sense of humor. 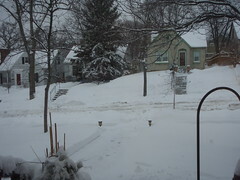 If you are not from here, trust me when I tell you that snow removal in MPLS is no laughing matter. I read a thought-provoking post on Quince Urban Homestead tonight comparing our current state of affairs to 1776. I feel that this post is indicative of a growing sense of disillusionment resulting from the fact that despite the triumphant ascension of the Obama administration to the White House, it pretty much seems like status quo around here. We're still at war, still running up the deficit, still sending money to publicly held corporations (and now putting shareholder risk on the shoulders of the nation in the process), and still underfunding education, libraries and social services. 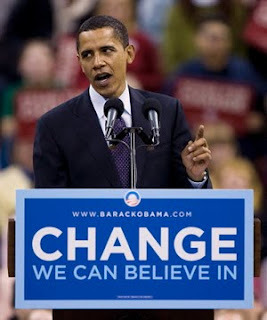 While it's tempting to say that we've been cheated and quip that the ubiquitous Shepard Fairey image had a typo and "Hope" should have an "N" instead of an "H", I think something is afoot that is more alarming than being misled by yet another politician. I submit that we have allowed ourselves to become a nation that is run not "by and for the people", but rather by and for special interest groups. It seems like politics has become not so much about representing the Will of the People as it is the platform (or the battleground) for special interest groups to influence public policy to suit their agenda. 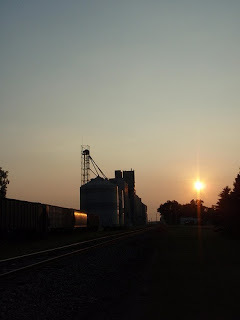 Pick an issue - Israel, global warming, education, immigration, ethanol and wind power; you name it, and special interest groups are at work monitoring legislation and seeking "access" to sell their agendas to our elected officials. About the only solution I can think of at the moment is to start a massive lobbying campaign to give the average people a voice in Washington. We'd have to have good old fashion caucuses or something to come up with a platform, but if we could get enough members, we could aggregate our votes and potentially gain influence, or at least have a voice in the debates. Otherwise a tea party might be in order here in the not-too-distant future. Once during a particularly hectic period at work several years ago, I borrowed a chess timer to prove (to myself, I guess) that I had very little uninterrupted time. I would start the clock when I hung up the phone or someone left my office and stop it at the next interruption to measure how much"quiet time" I was getting at work. The longest period, as I recall, was about 7 minutes that day. I do the same thing to myself when I am away from work, too. If I am home, in all likelihood I can be found on the computer, puttering in the basement workshop/music area, reading and/or listening to music or watching TV. Like the characters in Infinite Jest, I rarely sit still for very long without something to entertain me. And I doubt I am unique there; I think it's likely that many of us have programmed ourselves into a sort of hyper-stimulation dependency. On Sunday, I took a break from my hyper-stimulation habit (for one hour, at least) by attending an unprogrammed Quaker meeting. Essentially, the way these meetings work is that the attenders (sic) gather together and sit silently, reflecting on God and finding a message or two. Eventually someone is moved to speak, and they do. The others listen silently and then reflect on the words, see if those words change their thoughts, and then do some more thinking. I have always liked meditation (although I am admittedly not a big practitioner), but I was very surprised at how natural it felt to be among a group of people reflecting together, how quickly the time went by, and how interesting the whole experience was. I was never bored and never uncomfortable with the silence, and while I wouldn't say I "got a message", I certainly did get a few things worked out while I was there, and I find I am looking forward to more quiet time in the near future. A reader of this blog was good enough to invite me to come on down to Miami tomorrow and ride a bike-based contraption called The Regurgitator and perhaps join in some festive Tall Bike Jousting. That's kind of short notice for me, so I am not going to make this. Looking at The Regurgitator, that doesn't seem like something I would be up for, either. I have to admit, though, that the tall bike jousting looks like a lot of fun (up 'til the very end part). 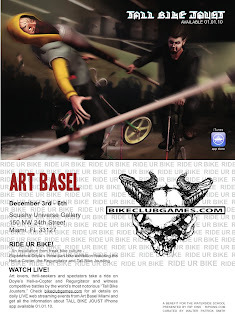 At any rate, I thought some readers be interested in vicariously sampling the alt bike scene in Miami. The event will be at Art Basel, which modestly claims to be "the most important art show in the United States, a cultural and social highlight for the Americas". Don't be disappointed if you really, really want to see this and just can't get away to Miami on a moments notice. You don't have to travel if you don't want to - you watch the festivities live on the interwebs at Bike Club Games right here.